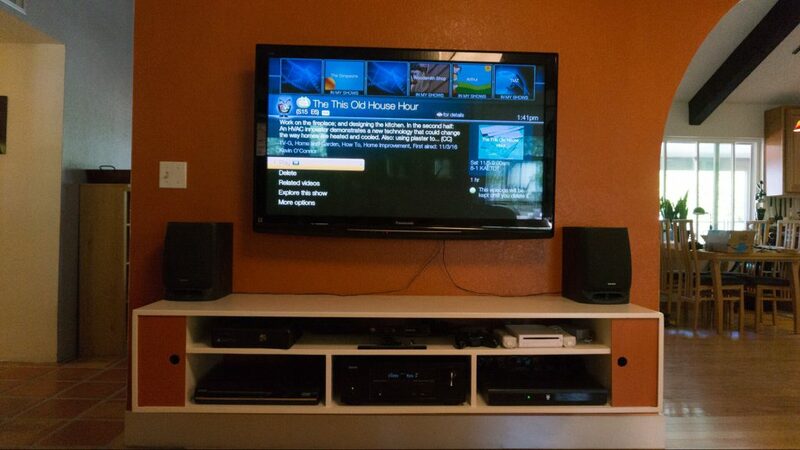 I built a custom floating media console to hold all of the AV equipment in our family room. We used to have all of our non-theater AV equipment in a very nice rack in our primary living room but at some point we made the decision to move all of this into our “Orange room” (e.g., the family room). This room doesn’t have the same type of space that our original room has, though, so there was no way to use our existing rack. That meant either buying or building a new one and knowing me, there was essentially no chance I was going to buy one. Thus, the need for a custom media console to hold all of our equipment. I started with a SketchUp model (download for free here) to work through the concept. First off, I wanted it to be a floating console since those take up less visual space and I tend to think they look better anyway. The console then has two layers — the top layer (or shelf) has the gaming equipment and the bottom has the bays containing our AV equipment. On the top, then, we have our XBox 360, then the Kinect (more on that later) and Wii sensor bar, and then the Wii itself. The bottom has three bays, starting off with our instantly obsolete early-adopter HD-DVD player, followed by a Denon AVR, and finished off with a TiVO Premiere. We also have a FireTV Stick but that’s directly plugged into the TV. There are two cubbyholes capping off each side of the console that can hold DVDs or games or whatever. They are mostly closed. 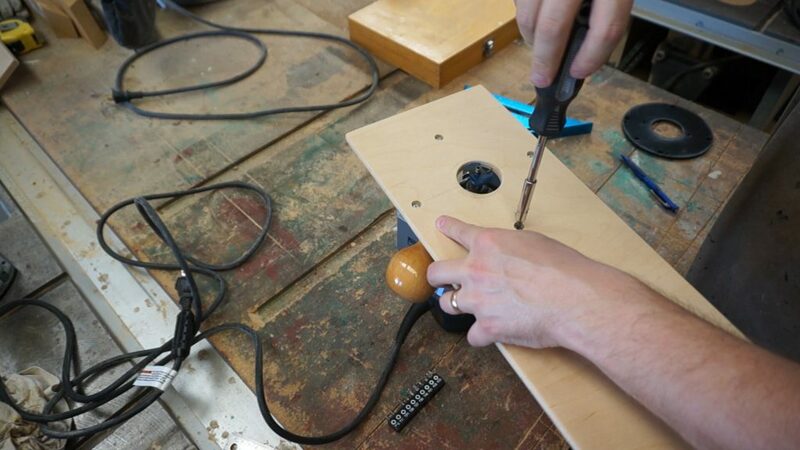 Most of the console is made up of 3/4″ plywood. Had I subtracted one inch off of the height, I could have done it all with a single sheet… but as it is, I ended up using one sheet and then some scrap pieces to make up the difference. 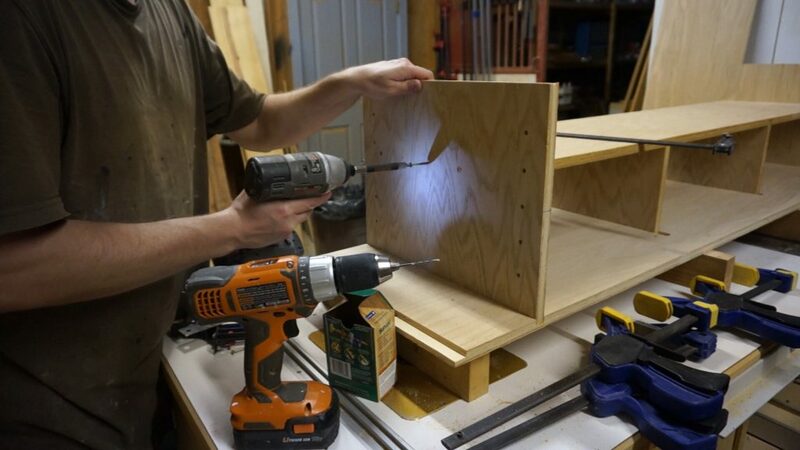 I wanted to use a few screws as possible and so most of the plywood shell is held together with glue in dados or rabbets. 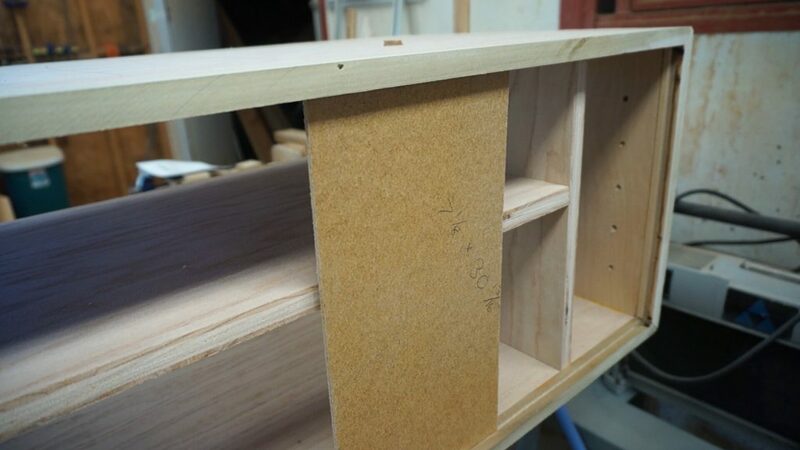 The front perimeter of the console is ringed with a 3/4″ poplar face frame. That’s there because I needed something in which to cut grooves. 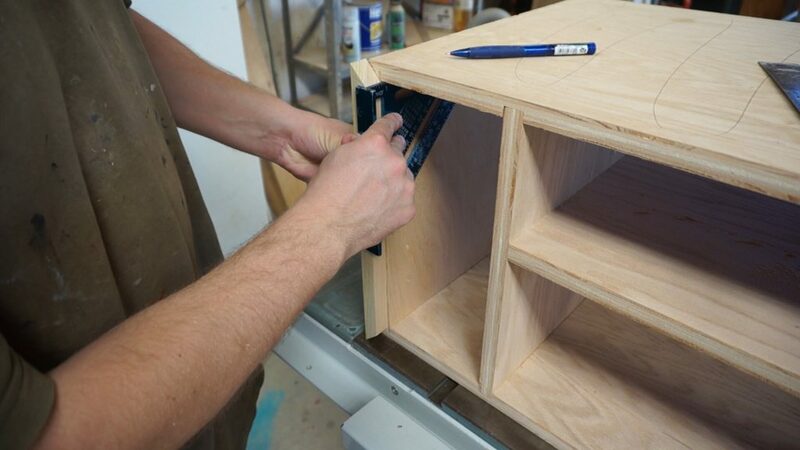 The grooves are there to hold the two cubbyhole doors, which are made from 1/8″ hardboard. 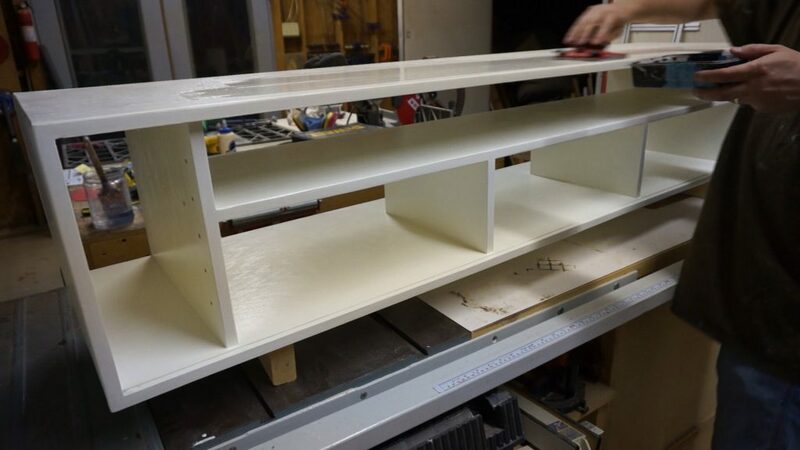 The shelf and partitions that delineate the equipment are all shorter than full depth of the console. That was to allow for wires to be passed up and down and side to side as well as to help facilitate air flow. Finally, the entire console is supported by a hardwood rail that is attached to the console and then screwed into four studs using pretty beefy screws. Oh, another goal of mine was to exclusively use material that I already had on hand. And so when I went looking for full sheets of 3/4″ plywood, I noticed this sheet of oak veneer plywood. That baffled the heck out of me since I have no memory of getting it. I also don’t know for certain why I would have, since the look of red oak is one of my least favorite looks in wood. Maybe it was the only reasonable “low void” plywood available when I was buying some? Well, since this was going to be painted, I figured I might as well use it up! 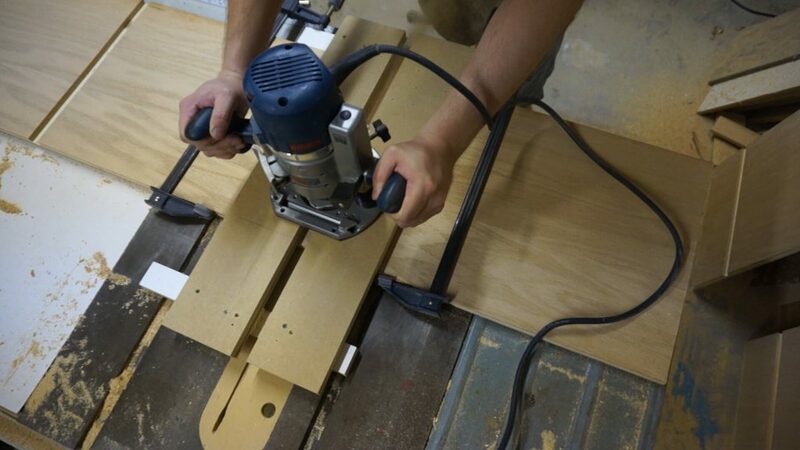 I started by cutting the strips to rough width using my skilsaw and a guide. 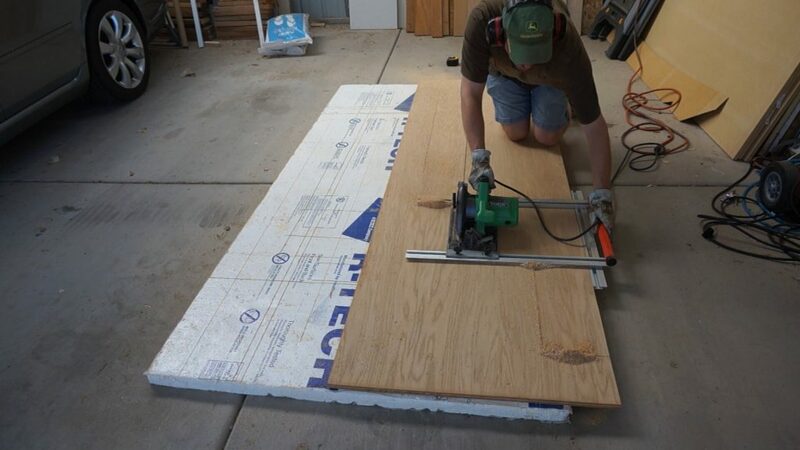 I do this on my garage floor by just laying the sheet on a piece of foam insulation. The initial cross cuts are also done using my skilsaw (this time using a custom jig) since the pieces are too long to handle easily on a table saw with the right cross-cut sled… and I don’t have such a sled at the moment. 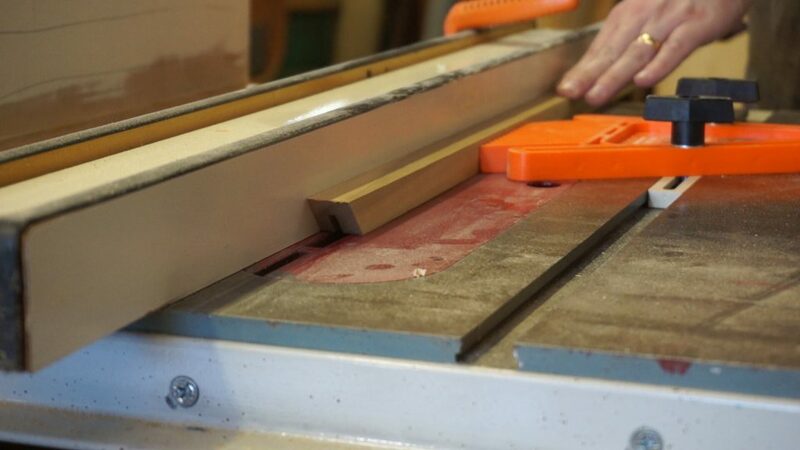 In both cases, though, I cut the pieces every so slightly wider and longer than necessary so that I could trim them to the precise size on the table saw. Most of the console was going to be held together with just glue and dados or rabbets and so that meant a decent number of them. Specifically, this required six full dados, two stopped dados, and four rabbets. 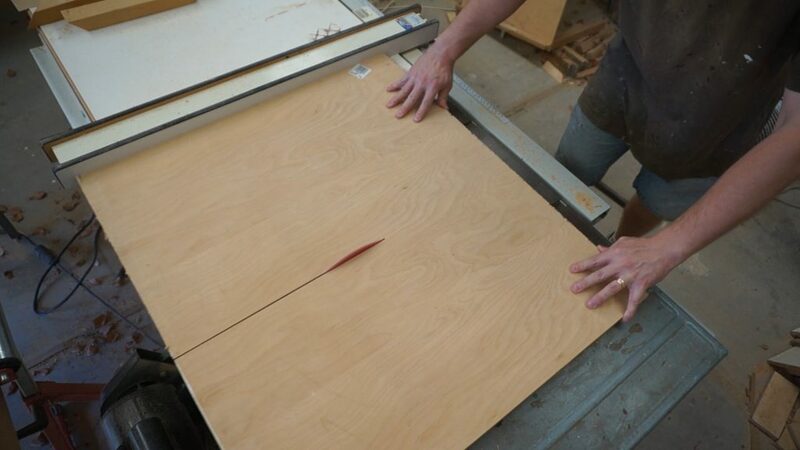 Since my inner pieces were going to be plywood, there was a need to create a custom fit dado width. I might have done it on the table saw with my dado set but these pieces were still notably long and as before, it’s tricky to use a table saw like this without the right sled. That meant using a router. 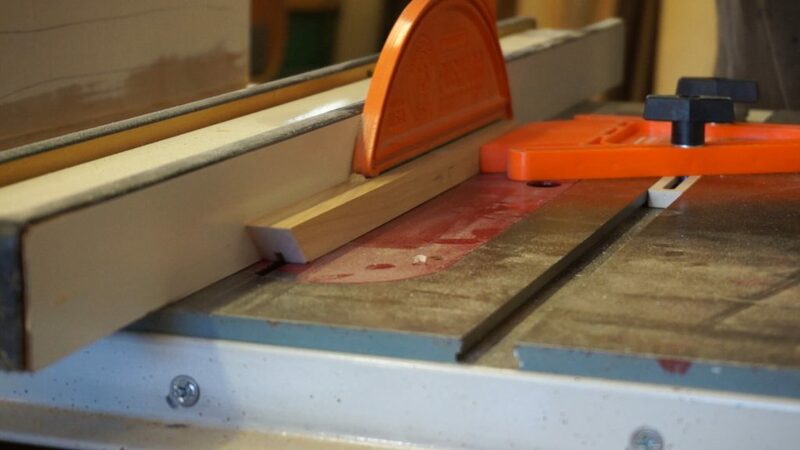 I’ve already made custom dado jigs out of scrap wood in the past (see here) and since they are so quick to make and are still so accurate, I did the same this time as well. There was one notable difference, though. 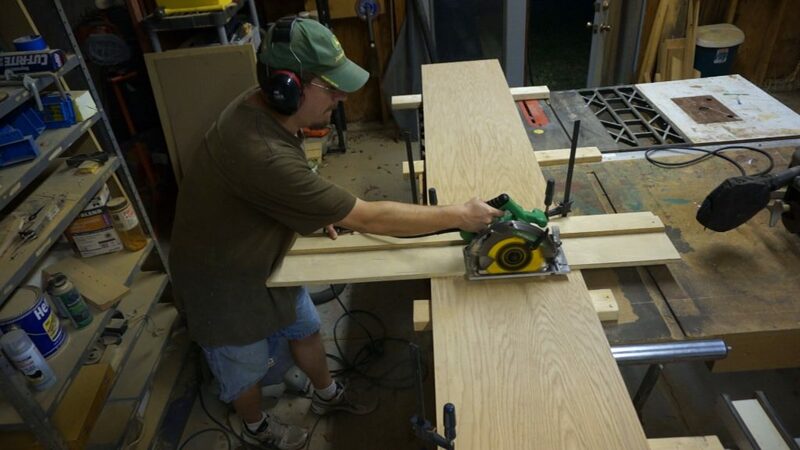 In the past, I depended on a pattern bit that was smaller than my dado to make it work. In this case, my dado was going to be just a tad smaller than my smallest pattern bit and so I needed a different method. In the end, I used a smaller non-bearing straight bit and then some guide bushings to guide it. That required some small tweaks to the custom jig but that was easy enough to do. I will likely create an updated post one of these days on how to make that style. The concept is the same between both styles, in any event. The beauty of these jigs is that not only are they extremely quick and easy to make, but the end dados and rabbets are absolutely perfect. While I was at it, I also drilled some shelf pins in the cubbyhole sides so I had a jig from a previous project already on hand. I have no idea why I’d want shelves there… but adding the holes now is trivial and would be a pain later if I ever did want them. Thus, I consider this a form of extremely easy future-proofing. 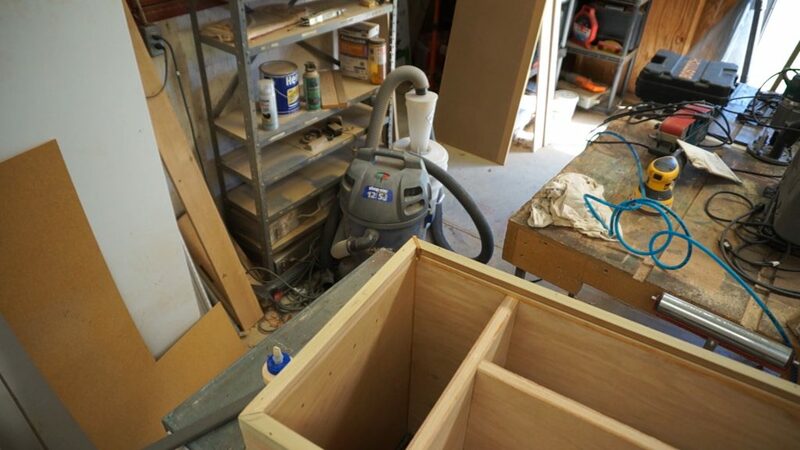 It occurred to me that it would be very difficult to sand the interior of the console after it was assembled and so I took the time to sand all of those surfaces beforehand. But… doesn’t it make sense that if sanding is a lot easier before assembly then wouldn’t painting also be a lot easier? Yes! Yes, of course it would be easier to paint at this stage! In fact, had I painted at this stage, then I could have done the bulk of it using my sprayer, which is the by far the easier way of painting. But for some reason it never occurred to me until after I had it fully assembled and was struggling with painting all of the cramped nooks and crannies. Argh! Lesson learned: prime and paint before assembly as much as possible. 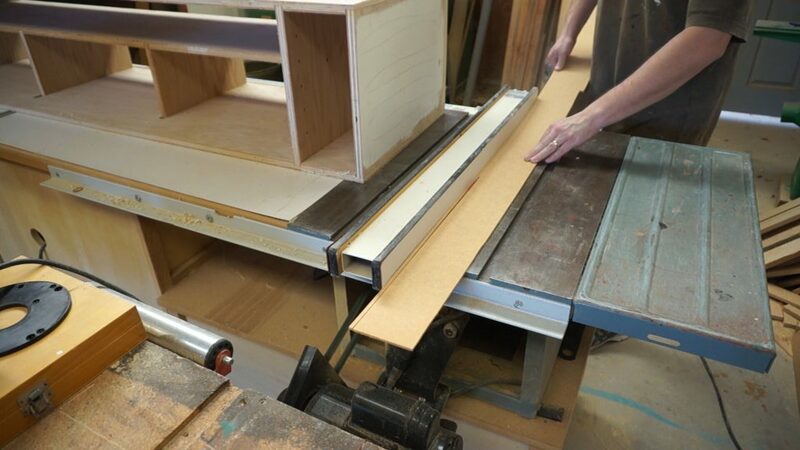 The bulk of the assembly at this stage was just fitting the right pieces in the right dados after gluing and squaring them up and finding some way to clamp them in place. I was experimenting with using an acid brush to spread out the glue for the first time but I only made it through roughly half of the assembly before switching back to using my finger. The brush was too slow even in general and it was made worse by having to pick out pieces of the bristles every now and then. I was also using a fancy Glu-Bot glue container to start but switched that out to the regular bottle, as well. That was my fault, though, as I had allowed the Glu-Bot to get almost totally clogged with dried glue and as a result it spread far too thinly and too slowly. I did jump through a few minor hoops to try and ensure that the vertical pieces were square before the glue set. 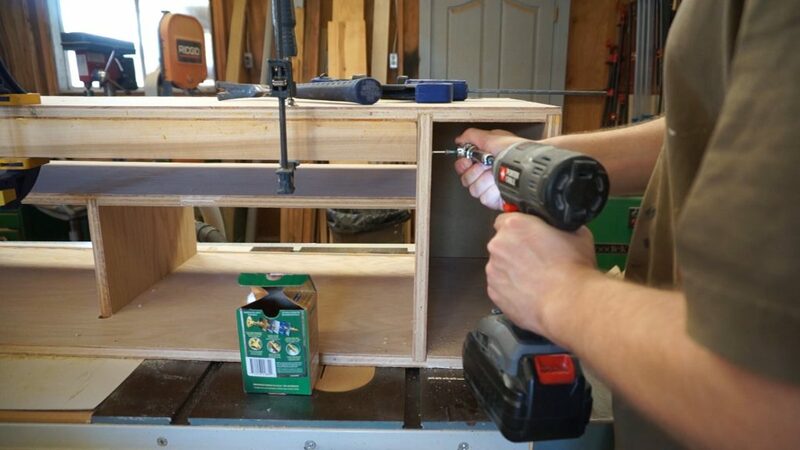 I also found myself having to improvise to get “clamping” force on the inside of the shelves, since I didn’t have any normal clamps deep enough. I ended up using some weights I have lying around on the shop. I did have to use screws for one aspect of this and that’s attaching the shelf to the side panels. The reason for that is because I made my AV bays a tad too wide. 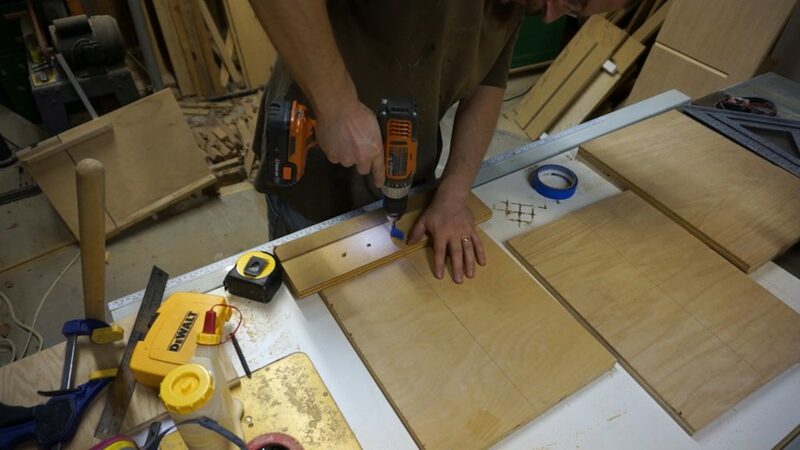 Had they been 3/8″ skinnier, then I could have cut dados into the side panels and used glue like the rest. I would have still had to figure out some way of clamping it… but presumably I would have been able to think of something. 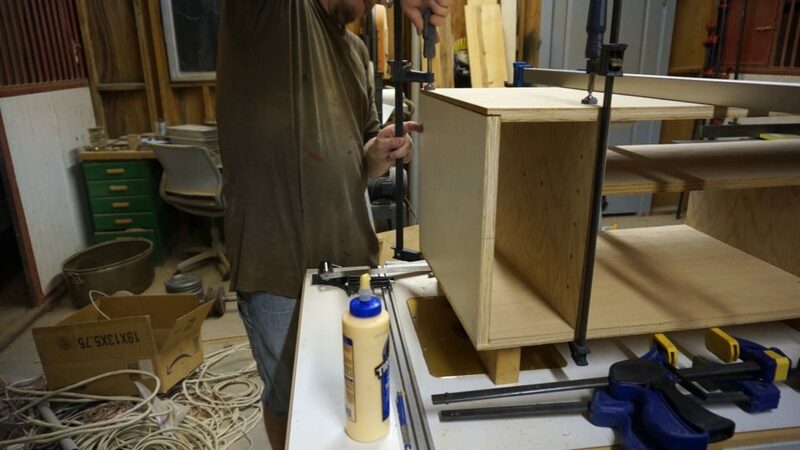 The side panels were then fit into the rabbets at the end of the top and bottom pieces. Somehow a combination of minute variations in the side of the panels and maybe variations in the depth of the rabbets resulted in the two sides not being precisely the same height. This ended up biting me in an unexpected way later. 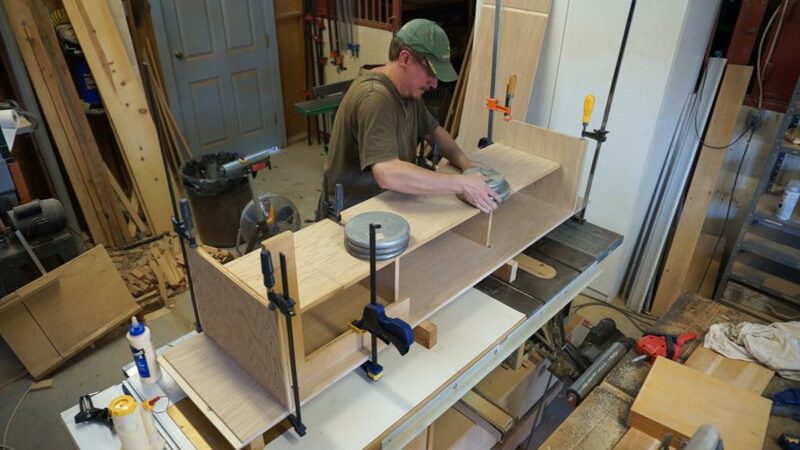 Next up was building the face frame that was going to hold the doors and allow them to slide back and forth. I needed to miter each of the pieces individually after discovering that the widths and lengths weren’t as precise as I had hoped. That is, if I put the wrong piece on the wrong side, there was bound to be a notable gap. Three of the face frame pieces got half-depth grooves. These included the bottom piece and both sides. I used a 1/4″ wide flat bottomed dado blade for this. 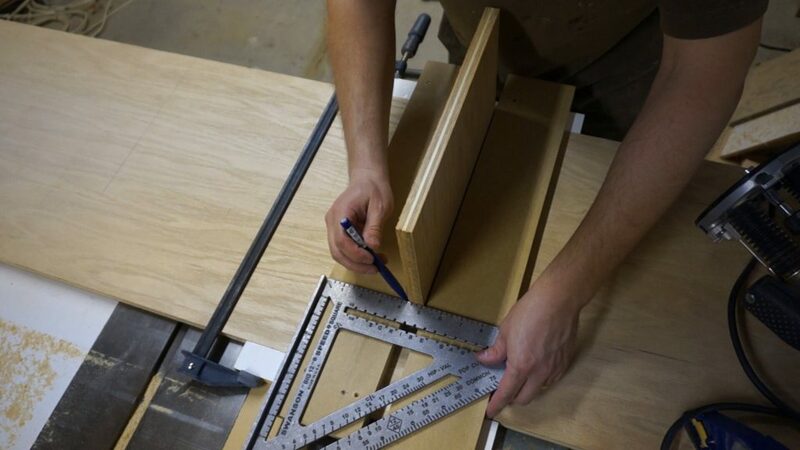 The top face frame piece got a double-size groove. The theory behind this is that I would be able to insert the door by simply pushing it up into the top groove. Since it’s double-depth, the door swings free of the bottom entirely. When I drop it down, though, it drops into the bottom groove while still remaining trapped by the bottom half of the top groove. The theory is sound. I fairly frequently make notable mistakes on projects like this but the screw-up I made this time was bigger than most. Look at the following photo and see if you can tell what I’m doing wrong, if you know that the piece I’m installing has a half-depth groove in it, intended for the bottom. Yep, I’m currently installing the half-depth grooved piece on the top of the console rather than the bottom. In fact, for some reason I had completely fooled myself into thinking that the bottom was facing me and so the two side pieces are also on the wrong sides. All four pieces end up being wrong. But I didn’t realize this until I was done installing all four and by that point I had even secured the pieces in place with brads. This was a notable problem because my entire door mechanism depended on the double-size groove being on the top. It simply cannot work at all of that groove is on the bottom, like I installed it. I should have realized that something was wrong much sooner since my face frame wasn’t lining up like it had in dry-fit. Remember how I said that the exact sizes needed for the pieces was going to bite me later? Now is that time. The mis-matched pieces ended up having gaps all over the place. One of them was too big to fix with putty. That one was about 1/8″ wide and so needed a more robust patch. I started by widening the gap until it fit a piece of scrap that I had lying around. I then fit the scrap into the gap and cut it down to size and then glued it into place. After it dried, I fired up my belt sander to sand if flush. It’s not visible at all after it was painted. I needed to make the top groove deeper in order to fix this and so I got out a slot cutting bit. I had to remove the bearing to give it enough depth for the groove to work like intended. 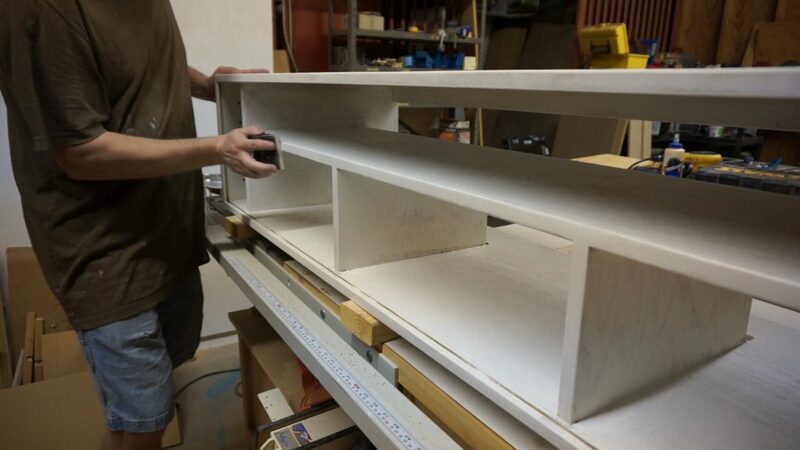 Using a bit like this on a 3/4″ thick surface like the face frame wasn’t going to be easy and so I made a custom router base plate. 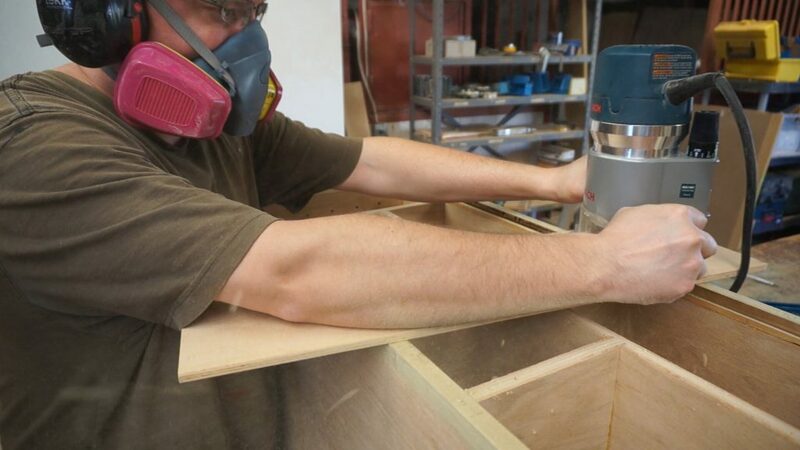 The custom plate was made of thin Baltic birch plywood that was long enough to span the console and I then just cut in the right holes and recesses to fit my router. I did forget that the holes weren’t centered on the router’s base and so my plate ended up skewed to one side. That’s no big deal since routers don’t need to face in any particular direction, anyway. The actual routing worked roughly like I had hoped. There were two unexpected side effects of using this bit without its bearing, though. The first side effect is clearly visible in the photo — I was using the bit’s shaft as the depth stop and this cylinder spinned fast enough to burn the wood the entire length of the groove. The second side effect was more surprising — it turns out that even a relatively smooth cylinder spinning at thousands of revolutions per minute is enough to essentially act like a cutting edge on its own and can hog away quite a bit more material than you’d think. The entire top face frame piece is notably “wavy” looking as a result. With the top groove at its proper double-depth, the bottom groove needed to be filled in to be half-depth. I did this using a very thin strip of hardboard. I just tapped the hardboard into the groove and since it was very slightly thicker than the groove, it ended up sticking in place without any glue and with just substantial friction. 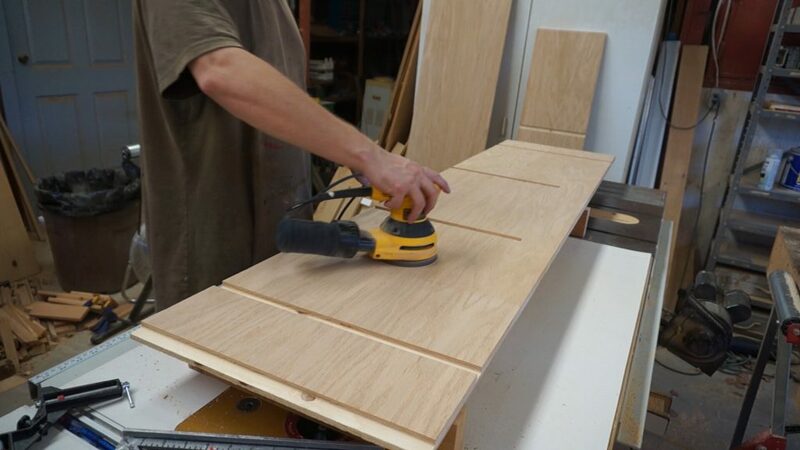 The doors are the simplest pieces on the console since they are just rectangular pieces of 1/8″ hardboard. I was originally thinking of using metal pulls on them as the door hardware but couldn’t seem to find something that would fit my needs. I then punted on the decision until later.. in which case I ran out of time and ended up just drilling some finger holes in place. The support rail is made of hardwood and it spans almost the entire width of the console. It’s glued on the three touching sides and then I drove in some pretty hefty screws on each side to add even more support. I’m never a fan of the finishing stage but this particular time was notably more of a pain than most, if only because of how many surfaces there are and how many of them are in super cramped spaces. This was all exacerbated because I wanted a very smooth and full surface, which required many coats with sanding in between. 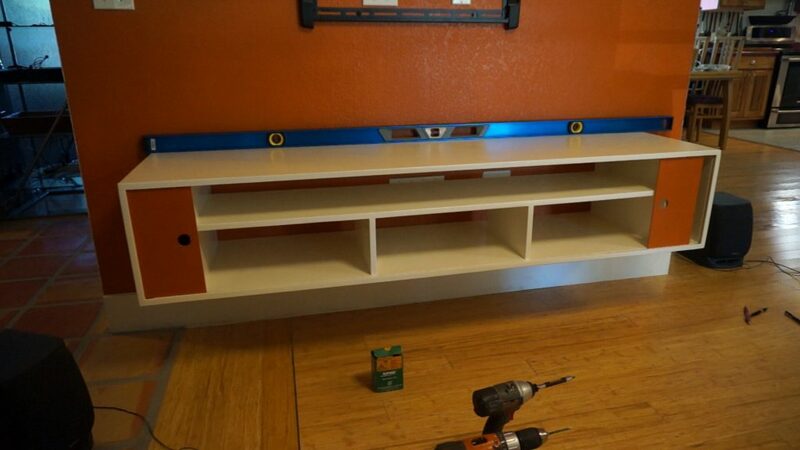 The entire console was primed with Zinsser B-I-N, which is a fantastic concealing primer. I put on several thin coats and sanded with 300 grit sandpaper between each coat. The paint was some shade of white Behr interior latex. That also required a few coats with sanding in between. That took a notable amount of time to do since I needed to wait for the paint to dry before sanding due to how much it pilled if it wasn’t completely dry. 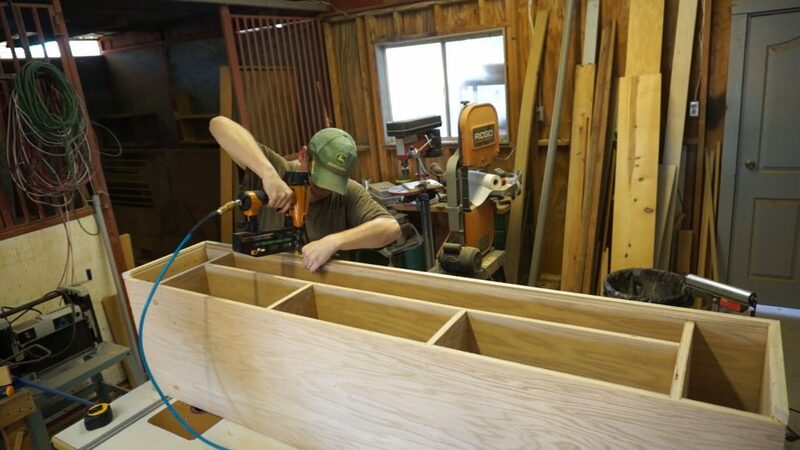 But most of the finishing time was spent on the edge grain of the shelf and partitions. Note in the previous photo how smooth and uniform the edges are and compare them to some previous photos of the unfinished edges. Basically my goal was to have edges that didn’t look like plywood at all and were completely smooth and flawless. I didn’t want to use edge banding, though. So what I did was start with a light sanding and then filled in all of the visible voids with wood putty. After that dried, I sanded it again and looked for any remaining voids. Those were filled with putty and sanded. I repeated this process three or four times. Then I primed it with B-I-N and looked for any voids with the new shadows. Those were filled with putty; sanded; and re-primed. I repeated this a few times. It was all worth it in the end, though, as the final look does look essentially flawless and there’s no way to tell that it was pretty rough plywood to start. All horizontal surfaces got a couple coats of Polycrylic with a light sanding in between. My thinking for the Polycrylic is that I knew that it dried to a rock-hard finish and did so fairly quickly. Latex paint has a reputation for taking a very long time to completely cure before it loses all of its tackiness. I didn’t want any of my AV components to “stick” to the paint, though, and so the rock-hard finish was necessary. This did work out very well! 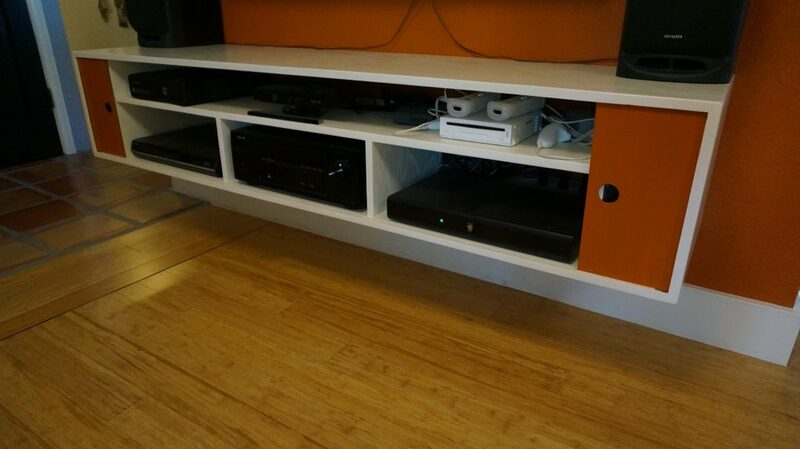 The console is centered on the wall and is “floating” one foot off the floor. I wanted it to be level even though the floor is not. 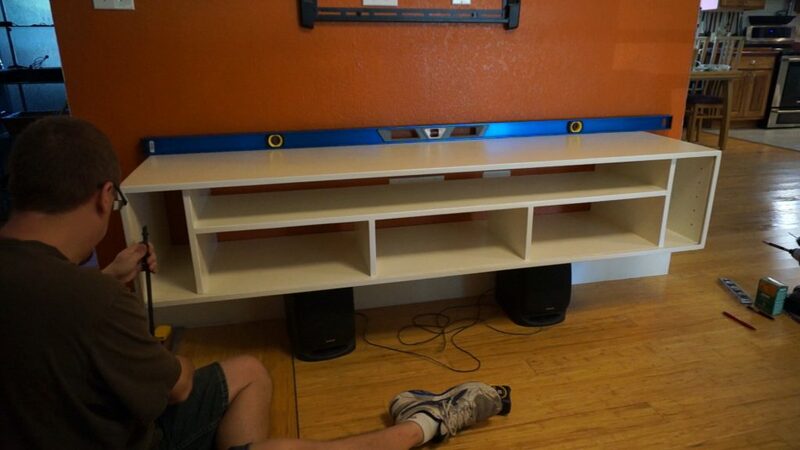 I started by resting the console on a pair of speakers that happened to be exactly a foot tall. I then placed a 6′ long level on the top and got out a quick-clamp. I reversed the quick-clamp’s heads so that it worked as a spreader rather than a clamp. I then used this spreader as an ersatz jack of sorts to very slowly jack up one side of the console until it was perfectly level. This worked pretty well. The console was then screwed through the hardwood rail and into four of the studs in the wall behind it. Each hole was pre-drilled so that none of the threads of the screws were biting into the rail itself and were exclusively into the studs. I then used pretty beefy 3″ long screws to do the actual attachment. In theory this is strong enough to hold even my substantial weight on the edge, although I’m not going to try it. It’s easily strong enough to hold up all of my AV equipment with plenty of strength to spare. Here’s what it looks like all installed and in a working state. The speakers aren’t hanging on the wall since they are just temporary. You don’t see any other wires because this is hung on a custom media wall that shall be the subject of a future post. Overall I’m pretty happy with the outcome of the console. I do like how it looks quite a bit and it holds all of my components just like I wanted. If I did it again, I would tweak the dimensions enough to be able to use only a single sheet of plywood. I would also not make the same “groove” mistake a second time. Priming and painting would be done prior to assembly. And I would create better pulls for the doors. Actually, I may remake those doors regardless and maybe just make some simple wood pulls for them. I’m not a fan of the finger holes at all. My design did end up being wrong for the Kinect. As it turns out, this position is simply too low for the Kinect to work like expected. It’s much better suited on top of the TV. What I probably should have done is accounted for this in the custom media wall… or at least provided some way for the Kinect cable to come out the top of the console. As is, whenever we want to use the Kinect we have to pick it up and manually place it on top of the TV, which leaves the cable all exposed. Not a huge deal, but definitely a bit visually jarring compared to the otherwise wire-free setup (ignoring the temporary speakers). But yeah, overall I’m very happy with the results!